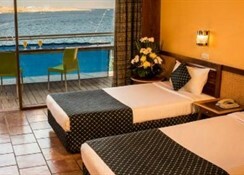 The Lido Hotel enjoys a plateau-location on Om El Sid hill on the Red Sea coastal resort of Sharm el Sheikh, Egypt, just a 2-minute walk from the renowned Naama Bay and the centre of the town. Offering an All Inclusive option, the Lido Hotel has only 76 smart rooms contained within a boutique-style setting, and yet offers a fine choice of gourmet dining, casual fare and snack refreshment venues. You can enjoy an outdoor pool, Jacuzzi and massage service, table games, and easy beach access with the chance to spend some of your budget to snorkel and scuba dive in this popular water sports resort. 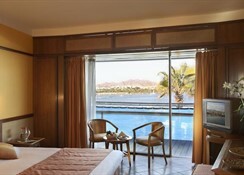 The medium-sized Lido Hotel offers a fine option for an affordable holiday break at Sharm el Sheikh on the Red Sea coast of Egypt. 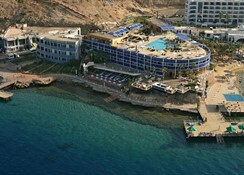 Getting to the hotel: 11km from Sharm el Sheikh International Airport. 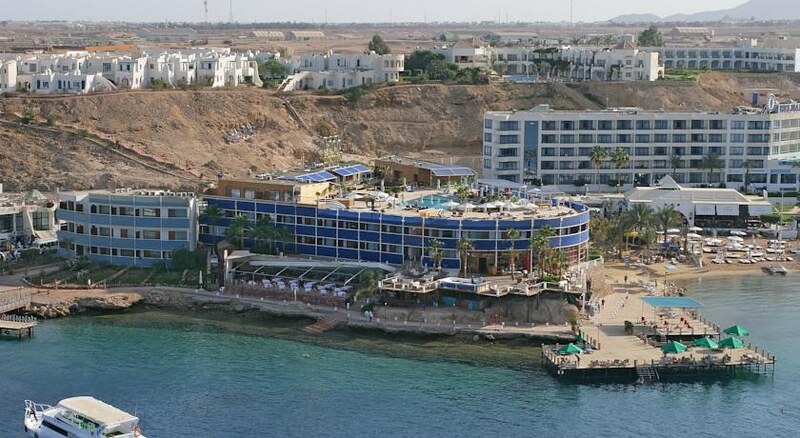 Local tips: The hotel's location at Sharm el Sheikh lends itself to the scuba diving and snorkelling opportunities which this part of Egypt is renowned for. Food, drink and entertainment: Dolphino Restaurant with outdoor terrace and sea view offers all-day dining options of international cuisine; La Folie Terrace Bar Restaurant serves a la carte dishes, cocktails and beverages and has relaxing music; On Deck Restaurant is a “floating” venue extended into the bay and offers seafood and international gourmet dishes; the Pool Bar with dining area serves a selection of salads, snacks and cocktails; the Beach Bar offers local specialties, grills and barbequed meats and refreshments; and there is a regular evening entertainment programme including live music shows. Sport, games and activities: Swimming pool, sun terrace with loungers and parasols, Jacuzzi and massage facilities, table tennis, darts and billiards (charge), and easy beach (sandy) access with opportunities for payable scuba diving and snorkelling, including lessons. Additional: 24 hour Front Desk services, housekeeping, 24 hour Concierge service, ATM Machine Service, 24 hour room service, WiFi internet access in lobby, laundry & dry cleaning service, and further standard reception services. 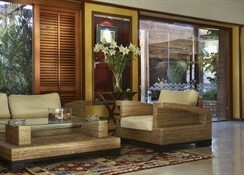 Guest rooms available are Superior, some have a sea view and also Junior Suite with a sea view. All have an attractive décor of soft pastel-toned interiors, complementing drapes and fabrics, smart furnishings on cool tiled flooring and modern amenities for your comfort and convenience; features include a private furnished balcony or terrace, individually controlled air-conditioning, en suite bathroom with shower, hair dryer and shaving point, satellite TV, direct dial telephone, comfortable seating and dining table, mini fridge and safe box. Meals:Breakfast, Restaurant, Daily: 07:00 - 10:00.Lunch, Restaurant, Daily: 13:00 - 14:30.Dinner, Restaurant, Daily: 19:00 - 21:30.Morning Snacks, Beach Bar, Daily: 11:00 - 12:00.Afternoon snacks, Pool Bar, Daily: 16:00 - 17:00.Drinks:Locally produced Alcohol; Locally produced non Alcohol, Bar, Daily: 11:00 - 23:00.